For all the excitement over the opening of new seats on the Supreme Court, little attention is paid to the makeup of state courts. 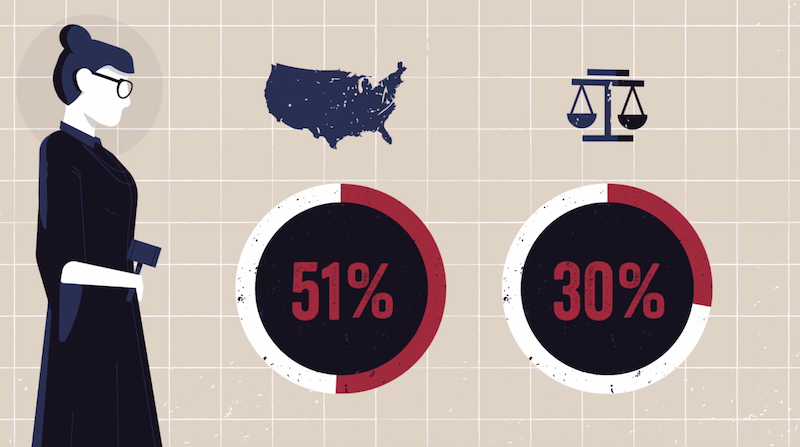 A new report from the American Constitution Society finally analyzed the demographics and found that the judges in these courts, who are in charge of presiding over 90 percent of the cases in the United States, are mostly white and male. The report, entitled “The Gavel Gap,” by Tracey George and Albert Yoon, analyzed over 10,000 judges on state supreme courts, state intermediate appellate courts, and state general jurisdiction trial courts. It found that, although women make up half the population of the U.S., they make up only 30 percent of state court judges. People of color make up 38 percent of the population, yet only 20 percent of state court judges. Those numbers go down when you look at individual states, or the specific types of courts (for instance, judges in state trial courts, which preside over criminal trials, are considerably whiter than their defendants). Image via the American Constitution Society.